Your readers want expert advice, not a sales pitch. They need to get a feel for your credibility. Once that credibility is established, they will trust you enough to surf to your site. Introduction – Be frank. Let your reader know exactly what you are writing about. This will create stickiness (the effect where a reader stays to read your article, rather than clicking someplace else). Body – Use your outline to provide informative, quality content which includes facts, tips, etc. Brevity – In this day and age, leisurely readers are few and far between. They want their information now. Readers spend two minutes or less on an article! An average of 400 – 500 words gives you enough space to build your topic without creating “word vomit”. Conclusion – Make sure you have delivered on everything that your reader was expecting! Resource Box – Your Resource Box should only be 15% the length of your article body. Once you have gained the readers trust, you can tell the reader about your company/product/service and link to your site. Title – Grab the reader’s attention without slamming them with SEO and make sure your hook matches your article topic. Proofread. Proofread. Proofread. – If your reader sees an error – *click* they’re gone! If you’ve frequently had articles not get approved due to overly promotional content, it’s a habit you’ll need to break. Use the tips above to help you load your next set of articles with value instead of salesmanship. And leave a comment below if there’s anything you don’t understand. Click here to see the entire “From My Desk to Yours” Blog post series. I’ve never done it, but have wondered about linking to a previous article. From this I gather that is not allowed. Right? 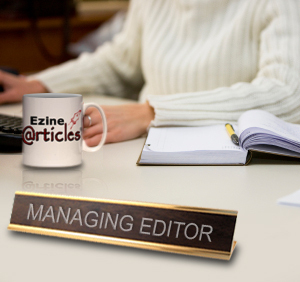 You can link to another EzineArticles article as long as the article is in a series or you are linking to your Expert Bio page. I mainly agree with you, Penny. I noticed that my articles attract more readers when I give them new information or advice, without promoting my ebooks at all. I only wish we could mention previous articles in a new one, like Marte does; not because I intend to promote my previous articles, but because many times I need to give a complex lesson to my readers, and it would be helpful for them if they could read more explanations about the same matter in a previous article. Im trying to keep my articlesword count around 500 words because this is the kind that most people prefer online, however when I want to give a complete lesson to my readers, my articles cannot be shorter than 800 -1000 words. These articles take more time to be written, they are not ideal for everyone because they are too long, but they usually attract too many readers with time, because the information given is precious. This is totally different from the “word vomit” you mention. However, I agree that we have to try shortening our articles unless we really have something substantial to write about that cannot be summarized. We should eliminate repetitions and unnecessary details in order to give to our articles the preferred size, and especially, in order to give to our readers the information they are looking for directly, without any fluff. The results are much better when we respect these rules. Penny…nice post….so I must ask…in your free time what do you enjoy reading? Fiction, non fiction? Favorite author? Free time? What free time? Just Kidding! Fiction – I love mystery and Dean Koontz and Stephen King are my favorite authors. Non-Fiction – The Encyclopedia’s (really), I am through W. :) I also like to read motivational and leadership books. After publishing more than 100 of my articles since April 2008,I had three bounced for no apparent reason late in 09. I adjusted them. But I still don’t know why they were weren’t acceptable in the first place. I know you get mountains of articles. And I know that lots of them are unacceptable for a variety of reasons. But generalised reasons written in “bureaucratise” aren’t much help in revising them. I don’t expect a personal note. But some indication as to the specific reason for the bounce would be very helpful to those of us who really value our relationship with you. We do our best in providing as much detail as we can in our emails without sounding like a broken record or providing too much information that we lose you at hello. If you find that we are sending you an email back that is very general, please contact us. We will be more than happy to further explain details that were omitted from the first point of contact. Our front line editors don’t have the ability to provide many details. If the area is more gray and requires more communication, this channel is reserved for our Member Support team which will provide a more detailed explanation. We are always reviewing this process of communication so know that your opinion matters. We appreciate the feedback. This happened to be just yesterday and I have over 1,000 articles published and feel I know the rules pretty well. I sent in a ticket asking to clarify the problem and a support team member was able to help me out. The first response still left me confused. Not meaning to be pushy but wanting to prevent the problem in the future, I sent a reply and the reply to that cleared it all up for me. I say if you have questions about why something was rejected, don’t be afraid to ask and ask again, if needed. Just be patient waiting on your response. They’ve always been great about explaining to me in detail when I needed it (and sometimes I do- hehe).